Brian Chaim Becker, a young man from the United States who arrived in Israel this week, is the latest oleh to make aliyah through a unique program for young religious men aged 18 to early 20s. After landing in Tel Aviv Chaim travelled directly to the Golan Heights where his new home, Mechinat Keshet Yehuda, is located. The mechina is a pre-military academy that adheres to the philosophy of Rabbi Avraham Yitzchak HaCohen Kook zt”l, the first chief Rabbi of Israel and the leading force in the creation of the national religious movement. 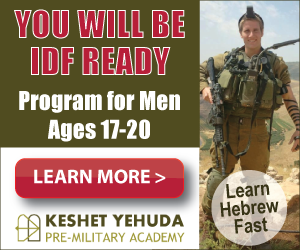 Since 1992 boys have been coming right after high school to Mechinat Keshet Yehuda from all over Israel in order to prepare themselves both physically and spiritually for the army. Three years ago two young men from the US decided to make aliyah and wanted to make it into top combat units. They heard of the mechina’s reputation of being one of the top producers of soldiers for fighting and elite IDF units, and decided they preferred it to program that cater mainly to English-speakers. Their aliyah and integration was very successful, so much so, that the Mechina manager Shuki Kastenbaum saw this as his duty to expand this program. 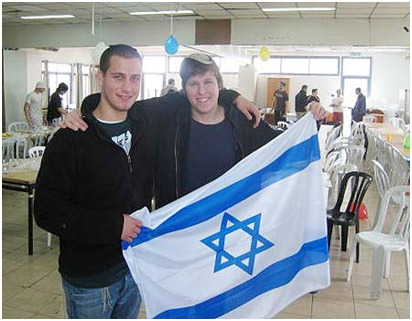 Since then more have come, made aliyah right from the program and are now serving in the army. Chaim is on the Pilot Year program offered at Mechinat Keshet Yehuda, this program is specifically for those that would like to see what it’s like to live in Israel like an Israeli his age, but without any of the commitments that come with aliyah. He came to Mechinat Keshet Yehuda from Silver Springs, Maryland. His inspiration to make aliyah began at his first visit to the Western Wall, when he was 16. Chaim recounted: “It really wasn’t the Wall that captured my attention at first. When I arrived, I started looking around and realized how many different kinds of Jews there are in the world, yet I felt a connection with all of them, no matter what they had or didn’t have on their heads. A year later, back in his school in Silver Springs a representative from the mechina came to talk to students about the unique program. Chaim was sold, but his parents were less than keen on him making aliyah. However, upon learning of the one-year Pilot Program they decided to allow him to go. Mechinat Keshet Yehuda’s Aliyah program integrates the olim and those on the pilot year program (those that want to try things out before committing to aliyah.) into over one hundred Israeli boys. The integration process includes a Hebrew uplan and by living 24/7 with Israelis, learning Hebrew is much faster. Integrating into Israeli society is a lot easier too; The Israelis naturally adopt their counterparts, thus giving these boys new family, friends, connections and when the time is right… a good potential for shidduchim (matchmaking). To make the technical processes smoother Mechinat Keshet Yehuda works hand in hand with Nefesh b’Nefesh and all the other relevant agencies.